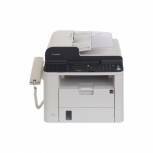 Canon i-Sensys FAX-L150 Laser Fax Machine White 5258B020 Pack of 1 Canon i-SENSYS FAX-L150 Laser Fax Machine 5258B020AA FAX-L150 33. 6Kbps modem speed (3 sec transmission speed). 15 one touch, 100 coded dials. 30 sheet automatic document feeder. 18ppm print speed. Up to 1200 x 600 dpi resolution. 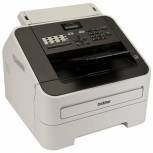 Brother FAX-2840 High-Speed Laser Fax Machine White FAX2840ZU1 Pack of 1 Brother FAX-2840 Mono Laser Fax Machine Grey. High speed super G3 laser fax. Up to 400 page memory. 30 sheet ADF. 250 sheet paper tray. 220 autodials. memory security. 33.6K modem. 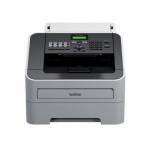 Brother FAX-2940 High-Speed Laser Fax Machine White FAX2940ZU1 Pack of 1 Brother FAX 2940 Mono Laser Fax Machine Grey.250 sheet input tray.USB.16 character 2 line LC screen.16MB RAM.30 sheet ADF.Windows.MAC.2400 x 600 dpi print.33.6Kbps FAX.200MHz processor. 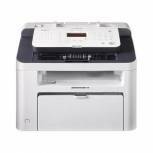 Canon i-Sensys FAX-L410 Laser Fax Machine White 6356B010 Pack of 1 Canon Fax-L410 Laser Fax Machine 6356B010AA. Industry-fastest, Super G3 laser fax machine with duplex ADF. Large LCD display. 512-page memory. Quick faxing with 39 one-touch and 200 coded speed dials. Fast copy and laser print speed: 25ppm.